Heat oven to 375°F. Unroll dough; separate into 12 breadsticks. Shape each of 6 breadsticks into a coil; place 2 inches apart on ungreased cookie sheet. Starting at center, press out each coil into 3 1/2-inch round. Twist each remaining breadstick and wrap around edge of 1 round to make 1/2-inch rim; press edge to seal and flatten slightly. Spread each with about 1 tablespoon sauce. 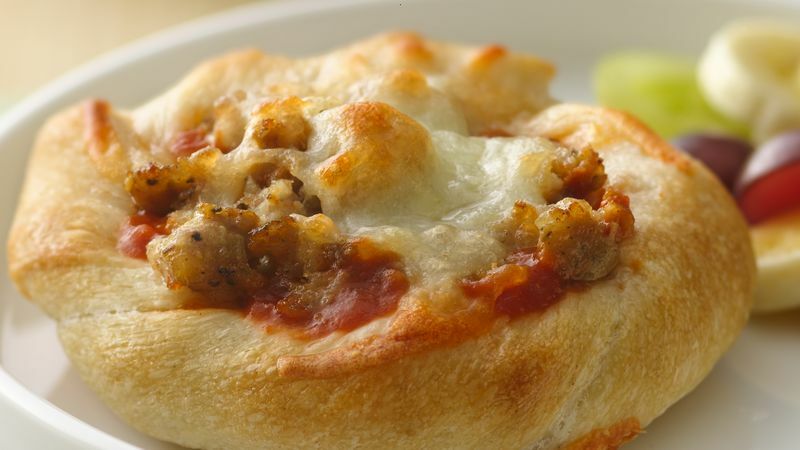 Top each with 1 crumbled sausage patty and 2 tablespoons cheese. Bake 15 to 17 minutes or until edges are golden brown. To make the pizzas a little spicier, use shredded taco-seasoned cheese blend instead of mozzarella.